the Triqueta is connected to the Walknot and it probably represents dynamic energy, it was mainly used by the Anglo-Saxons and the Frisians and it seems to have also been associated with the god Frey. I believe I read that somewhere. I got it because I liked what I read and a friend of mine has it too but he got it because he knew I liked watching The Charmed Ones. I told him what it meant and he really liked it. The triquetra has been found on runestones in Northern Europe and on early Germanic coins. It presumably had pagan religious meaning and it bears a resemblance to the Valknut, a symbol associated with Odin. The symbol was later used by Christians as a symbol of the Trinity (Father, Son and Holy Spirit). This appropriation was particularly easy because the triquetra conveniently incorporated three shapes that could be interpreted as Christian Ιχθυς symbols. A common representation of the symbol is with a circle that goes through the three interconnected loops of the Triquetra. The circle emphasizes the unity of the whole combination of the three elements. Modern Pagans use the triquetra to symbolize a variety of concepts and mythological figures. Germanic Neopagan groups who use the triquetra to symbolize their faith generally believe it is originally of Norse and Germanic origins. Celtic Reconstructionist Pagans use the triquetra either to represent one of the various triplicities in their cosmology and theology (such as the tripartite division of the world into the realms of Land, Sea and Sky), or as a symbol of one of the specific triple Goddesses, for example, The Morrígan. The symbol is also sometimes used by Wiccans and some New Agers to symbolize either the Wiccan triple goddess, the interconnected parts of our existence (Mind, Body, and Soul), or many other concepts that seem to fit into this idea of a unity. A triquetra design on the cover of a replica of the Book of Shadows from the television series Charmed.The triquetra is often used artistically as a design element when Celtic knotwork is used. Many who identify as Modern Celts may use the symbol to display an identification with Celtic culture, whether they live in the Celtic Nations or the diaspora. In recent years, the symbol has become well-known due to its use on the cover of the "Book of Shadows" used by the three sisters on the American TV show Charmed. It represents the three sister witches working together as one. 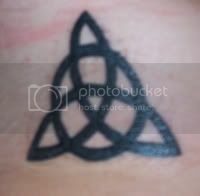 A triquetra is one of the four symbols on the cover of the Led Zeppelin album, Led Zeppelin IV, where it used as the personal symbol of bassist John Paul Jones. The triquetra has recently been adopted as the logo of the Ontario New Democratic Party in Canada. The band Payable on Death (P.O.D.) uses this symbol on most of their CD covers. The triquetra is used to represent the Trinity on The New King James Version Bibles, published by Thomas Nelson, Inc.